Your staff can sign students in and out quickly using the Attendance feature. The staff member can check off the names of the students as they walk through the door or transfer groups of students to a different room. 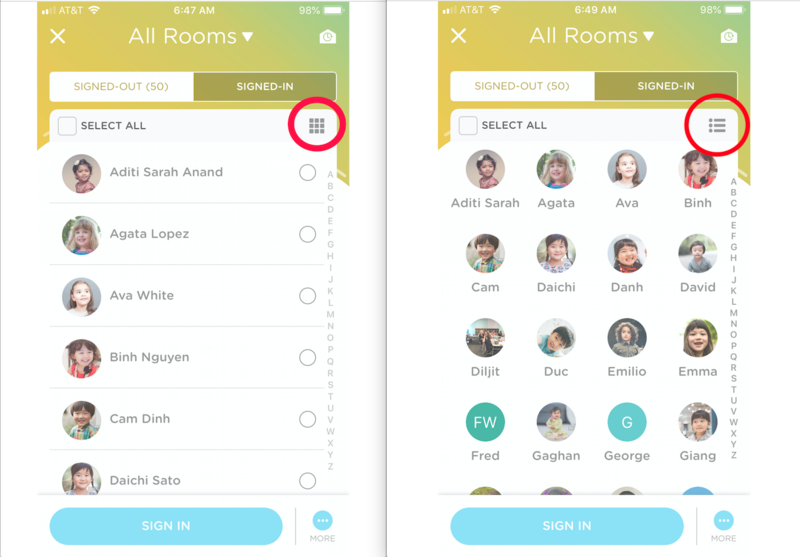 Open the "Attendance" feature in the Kinderlime App (see screenshot below). The attendance screen has two possible views. The first view is what you see on the left in the image below. You will see the children's full names and their profile circles displayed in rows. The second view is what you see on the right in the image below. This view shows all of the children with their name and profile circles in a grid-like view. You are able to toggle between the two views by clicking on the icon circled in red below. Optional: Filter the list using the "All Rooms" pull down menu. You can filter by Rooms or Tags. Check off the students as they enter the classroom and click "Sign In." If you need to adjust the time, room, or staff member click "More" instead of "Sign In" to see those options. Follow the same process above using the "Signed In" list of children (see screenshot below).